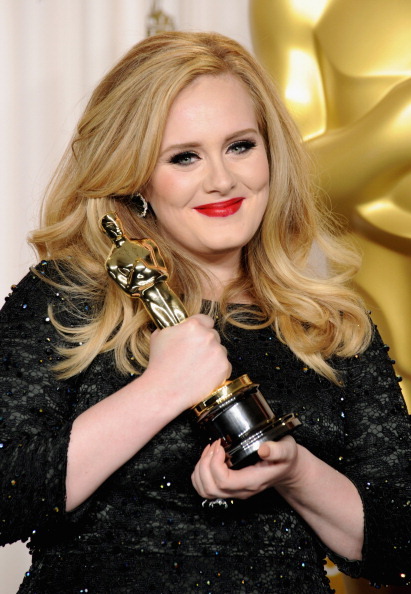 GOLDEN GIRL: Adele poses with her statuette in the press room during the Oscars at the Loews Hollywood Hotel in Hollywood, California. Easily the most alluring feature of Sunday’s Academy Awards ceremony in Hollywood was the music – specifically the vibrant song-and-dance performances that imbued the show with pure razzle-dazzle delight and some truly ovation-worthy moments. Think living legend Barbra Streisand rendering “The Way We Were” during the In Memoriam segment, and Catherine Zeta-Jones breaking out the wicked bob and slick moves for a nostalgic performance of “All That Jazz” from 2002’s Best Picture winner Chicago. Then there was Jennifer Hudson eliciting goosebumps with a red-hot performance of “And I’m Telling You” from Dreamgirls and Dame Shirley Bassey bringing the house down with “Goldfinger” during a special segment in tribute to 50 Years of Bond. Norah Jones and the all-star cast of Les Misérables also brought their A-game. Multiple Grammy winner Adele, for her part, sang the hell out of “Skyfall” and later copped the gold statuette for Best Original Song, alongside partner-in-rhyme Paul Epworth.